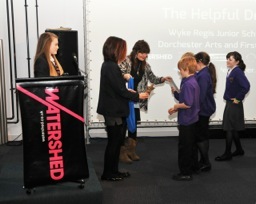 Film buffs from Manor Park First School in Dorchester who watch and review movies in their after school Film Club, have made a short film of their own. 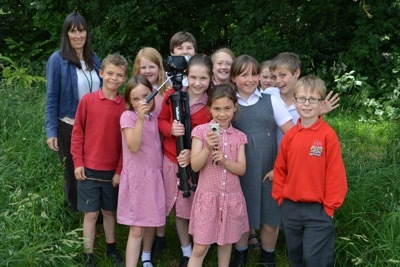 With support from national charity Into Film, the 30 eight and nine year olds have created an atmospheric five minute drama called The Stone - under the professional guidance of filmmakers Sharon Hayden and Alastair Nisbet from ScreenPLAY. 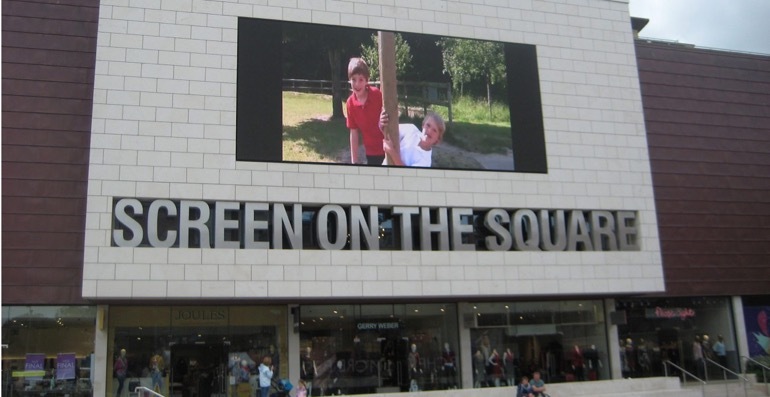 The film - premiered at the club's end of year celebration - was screened throughout the summer on the big screen in Dorchester’s Brewery Square. "Because it was quite a big group and our time was limited, we focussed on the movement rather than dialog," explained Sharon. “They have created some wonderful dramatic tension and beautiful movement." “We all did a drama warm up and then decided who was going to be an actor and who was going to do the filming,” said Susie, 9. 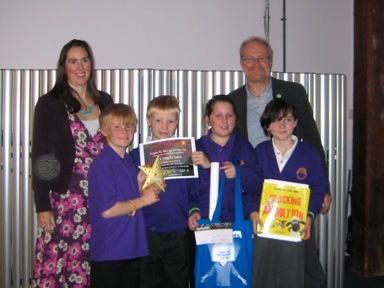 “We wanted to make it feel like we were on a journey through the forest - and were all a bit scared,” added Archie, 9. 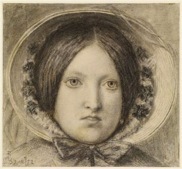 “I was one of the actors - it was epic !” said Mary, 9. People have been asking how to make an animated character swim. Like the walk cycle, the ‘swim cycle’ can be broken down into about six frames, but - as we have discovered - it can be surprisingly tricky to make your swimming movement look realistic. One effective way to achieve realistic movement is to film the movement in live action - and then pick out and print the key frames to use as a basis for the drawing. In real life, you don’t actually see very much of a swimmer’s body, but if you try to emulate that in 2D animation, it can look terrible. 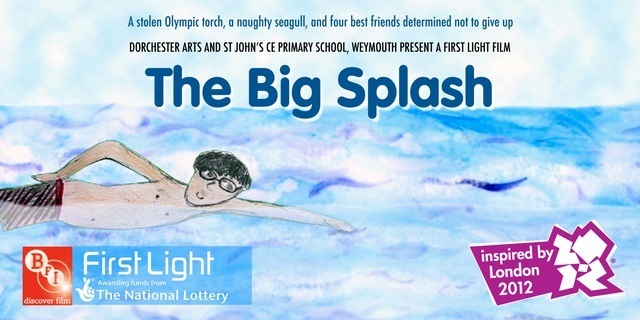 In our workshop film Splash, we simply put the swimmer on top of a wave background, and it looked sort of OK, but in The Big Splash, one of our films for the Cultural Olympiad last summer made by younger children, we added a translucent layer to slightly obscure the swimmer’s bodies below the water. Did it work ? You be the judge. Our next movement challenge: how to make a character curtsey ! 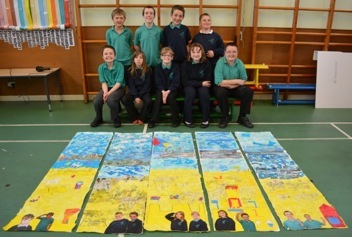 Children at five schools in Weymouth and Portland are working with artists from ScreenPLAY on a new set of brightly coloured banners for Weymouth seafront and harbourside. 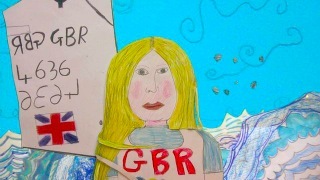 The legacy project in partnership with Weymouth and Portland Borough Council started this week with two day residencies by artists Heidi Steller and Sharon Hayden at Westfield Arts College and St John’s Primary School in Weymouth. 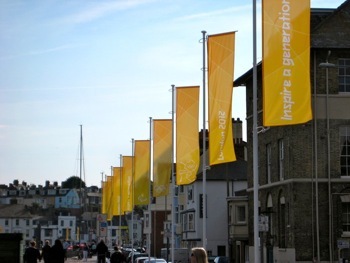 Remember the brightly coloured banners lining Weymouth seafront for the 2012 Olympics ? 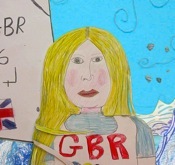 Schoolchildren in Weymouth and Portland will be designing a new set of banners for the seafront and harbourside as part of an Olympic legacy project delivered by ScreenPLAY in partnership with the Borough Council. “We’ll be working in five schools during the first half of the Summer term, supporting the children in creating vivid new banner designs which will be in place for the start of this year’s summer season,” explained project leader Sharon Hayden. Head of Olympic Legacy and Operations at the Council, Simon Williams said the banners were one of 66 projects which would help keep the Olympic feelgood factor alive. Work by young filmmakers in Dorchester is being screened at the historic Sydney Observatory in Australia. The Willow Pattern Story - a short animation from a workshop with Alastair Nisbet and Sharon Hayden - is being used to support a new archaeology programme at the Observatory, one of the city’s oldest buildings. 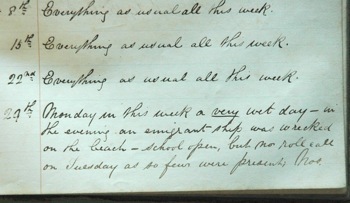 She said children on school visits will dig, inspect real artefacts and examine the original 1804 Fort and 1848 cottage. “The Willow pattern is very dominant in the finds and we ask them to put together a willow pattern plate from pieces excavated. They then make their own plate but we want them to understand that the plates have a story, and that the Willow Pattern story was appealing to British colony settlers. Your film will inspire them to create their own design for their plate”. Animation, old furniture, wonderful Irish voices - this delightful film by Tony Donoghue appeals on so many levels… which is obviously why it has just won the short film jury award for animation at the Sundance Film Festival in Utah. To call it an animated documentary about repair and recycling in rural Ireland just does not do it justice. I don’t know how long they will keep it on YouTube so watch and enjoy! I’ve just noticed that our short animation of the the Willow Pattern Story from a half term workshop a few years ago has topped 17,000 views on You Tube ! Seemed like a good excuse to tell people about it again. 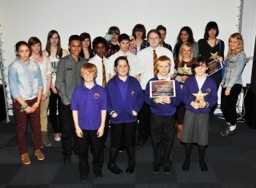 The young people who took part should feel really proud of their work ! Watch out for the not very subtle comedy moment. 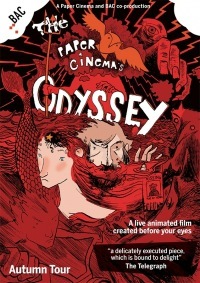 We were blown away by Paper Cinema’s stunning new feature-length show at Bournemouth last night - Odyssey. As the show starts you watch Nic Rawling draw the main characters live, while the credits flicker around them - and at that point you know it’s going to be an extraordinary evening. It’s Greek myth as you’ve never seen before - complete with hitchhiker, motorbike, speedboat - wonderful drawing by Nic and a fabulous soundtrack by his band. People are saying it’s the best thing they have ever seen - wow ! The tour continues until the end of November - don’t miss it ! The Renter from Jason Carpenter on Vimeo. Brilliant but unsettling film about daycare - and chickens - by Jason Carpenter. The Jaipur brass band and a huge processional dinosaur led Dorchester Festival 2012's extraordinary procession through the town to the Borough Gardens yesterday. Dozens of children dressed as Jurassic sea creatures, seagulls and even ice creams, carried brightly coloured ammonite flags or played in an amazing drumming band of junk instruments. Angel Exit unearth the dark heart of The Secret Garden, which sees spoilt Mary Lennox plucked from the bright vibrancy of India and transplanted to a big old house full of secrets on the grey Yorkshire moors. Presented in Angel Exit's rich visual style and blending storytelling with striking physicality, beautiful puppets, live singing and an original soundtrack, The Secret Garden is performed by an ensemble of five. This show for all the family is has been co-produced by Dorchester ARTS and Bridport Arts Centre, and co-commissioned by Lighthouse, Poole's Centre for the Arts, and Activate. 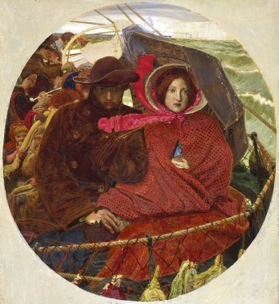 The Secret Garden is touring from January until the end of March 2012 and is funded by Arts Council England and West Dorset Leisure fund. This is Angel Exit's third show created at their base at Dorchester ARTS. It’s amazing what you can do with 288,000 jellybeans ! The Invention of Love - Andrey Shushkov’s beautiful animation in a silhouette style reminiscent of Lotte Reiniger. Just watch - it speaks for itself!